The city of Palermo has been selected as a member of the Coordination Group “Strong Cities Network”, a comprehensive program of city and local authorities aimed at strengthening social cohesion and the development of programs to prevent violent extremism. The Mayor Leoluca Orlando was in the official launch of the program at the Headquarters of the United Nations in New York with the mayors of the cities involved in the Leaders’ Summit on Countering Violent Extremism ISIL and hosted by the Presidency of the United States. Afterwards, the Mayor of Palermo participated in the work of opening the program, which were introduced by the High Commissioner for Human Rights of the United Nations, Prince Zeid Ra’ad Al Hussein of Jordan and the Mayor of New York Bill de Blasio, defining the work program of the network for the next biennium. The Network is involved in the GPM, Global Parliament of Mayors. What is the Global Parliament of Mayors Project? The Global Parliament of Mayors Project aspires to alter fundamentally how we govern globally in response to such pressing cross-border issues as climate change, immigration, the refugee crisis, pandemic disease, terrorism, nuclear proliferation, and volatile global financial markets. Our goal is to establish a new, nonpartisan global governance platform that empowers mayors to deliver viable cross-border solutions to global challenges. Specifically, the proposal is to establish a Global Parliament of Mayors, an unprecedented idea first put forward in the final chapter of Dr. Benjamin Barber’s 2013 book If Mayors Ruled the World: Dysfunctional Nations, Rising Cities (Yale University Press). The inaugural convening of the Global Parliament of Mayors will convene in 2016. The trends Dr. Barber depicted showing world leaders giving cities a new focus and importance have accelerated: in the spring, Prime Minister Cameron of the U.K. announced an innovative devolution strategy, giving cities new responsibilities; during the summer Pope Francis, following his extraordinary encyclical Laudato Si’ on climate change and justice hosted seventy-five cities at the Vatican. Michael Bloomberg, held a cities conference in Lyons with Mayor Hidalgo of Paris, giving expression to his remarkable article in Foreign Affairs “City Century” that makes a compelling argument for the new indispensability of cities. It is these trends and events that have further manifested the need for a Global Parliament of Mayors to respond effectively and democratically to the global crises we face and fill the void left by nation states who are increasingly dysfunctional — crippled by their old notion of independence and sovereignty in world that is interdependent and in need of collaboration. 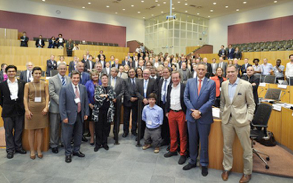 At the 2014 Planning Session in Amsterdam, 30 mayors issued a vote of confidence in the creation of a Global Parliament of Mayors. With that mandate, the GPM Project Team has been active, receiving commitments and support from over 100 mayors representing all corners of the globe. As we look forward to our inaugural convening in 2016, the GPM Project Team is working to expand its base of support among potential partners, funders, foundations, governments and corporations. We have a firm partner in US Conference of Mayors (Tom Cochran, CEO and Executive Director). We are in conversations with other potential partners including the White House Office of Intergovernmental Affairs, the European Forum for Urban Security, the National League of Cities, UN Habitat III, Mark Watts, Executive Director the C40 Climate Cities Leadership Group and the Strong Cities Network to expand our reach. We are establishing a GPM Project Advisory Board to advise the Project and create an inclusive, transparent development process. Members will include both former and current mayors, business leaders, foundation representatives and internationally acclaimed scholars. Along with these members of the Advisory Board, we will be inviting both sitting and former mayors, some members from our former Leadership Council, who will serve as our Executive Committee. The Executive Committee will oversee the development of the inaugural GPM agenda and other key planning items.